A big swathe of the press has been standing the results on their heads solely to pretend that the Tory position is much stronger than the numbers show. Some Lib Dems have begun an online petition to ditch party leader Nick Clegg, yet while Labour leader Ed Miliband is the target of an unrelenting hostile barrage of personal abuse, there is no press comment on how Conservative Party leader and prime minister David Cameron has presided over significant Tory losses and Labour is ahead of them. Overall Labour made some modest gains, increasing its number of councillors by 338 and the number of councils under its control by six. The Tories lost 231councillors and control of 11 councils. The Lib Dems lost a staggering 307 of their 427 councillors. The UKIP now have 163 councillors, though they won none in London. The number of votes won was not the new factor in UKIP’s performance. They did well last year too. Their achievement is to have repeated it a year later and they are showing all the signs of continuing their surge until the general election next year. This means the election will be a four-cornered fight. This is potentially bad news for the Tories. While it is true that the UKIP is having an impact in the Labour Party heartlands as well, it is on a different scale to the potential effects in the Tory areas. According to the Daily Telegraph, some Tories are saying that even if the UKIP’s vote in the general election dips to 6% or 7% it would scupper their chances of winning a majority. The paper also comments that the UKIP smashed the Tories in their Essex strongholds. The UKIP has established itself as a new party of the hard right with a significant electoral base. Its largely improvised program has much in common with the main demands that neo-fascist groups like the British National Party (BNP) advanced when they were trying to develop an electoral strategy. Nigel Farage, the UKIP leader, has achieved something akin to Marine Le Pen’s marginal detoxification of the Front National. However it was hardly necessary. The people who voted for him knew that they were voting for an anti-immigration package and every outrageous homophobic, misogynistic, racist remark from Farage or his newly assembled ragbag of candidates didn’t really matter. The exception to this was London where it made much more limited inroads. London is the most multicultural part of the country; Farage said that it is because it has a younger voter base. It is not only a youth problem for the UKIP; it is essentially a white party seeping votes from BNP supporters and Labour supporters who see no future in this country for working people. people want tougher controls on immigration… we have been making those arguments … people feel we don’t have the right kind of immigration controls and border controls. 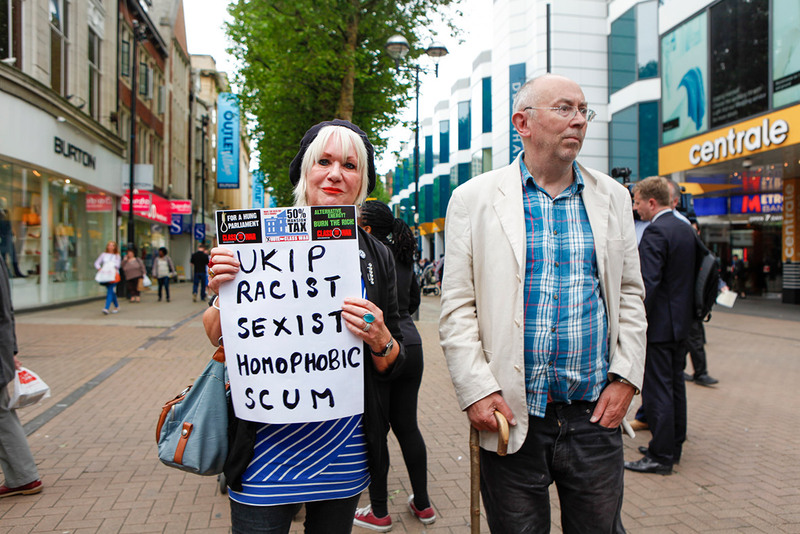 It is hard to imagine a more utter capitulation to the UKIP’s racism. Labour has lost some votes to the UKIP. Rotherham, where Farage’s outfit won 10 seats and is now the official opposition, was a traditional Labour stronghold. Basildon, a Labour target area returned 11 UKIP councillors. The Tory attitude to the UKIP is changing with an embarrassing rapidity. They are no longer describing the UKIP as “clowns and fruitcakes”. George Osborne, the person most likely to replace Cameron, has spoken of his “respect” for Farage and some MPs are floating the idea of an electoral pact. Partly this is because they don’t disagree with a lot of what the UKIP says, and partly it’s because they want to hold onto their seats next year. The left is not doing well. Left Unity stood a dozen candidates as a first election outing scored its best result in Wigan with 8.8%. The Trade Union and Socialist Coalition (TUSC) fielded several hundred candidates in areas where they had no base and no political profile. This was rewarded by votes typically in the region of 1% and the re-election of a former Labour Party councillor under the TUSC banner. The Greens had another 17 councillors elected and are now the official opposition in Liverpool and Solihull, Islington and Lewisham in London, and they remain the official opposition in Norwich. The Green Party now have 162 councillors on 56 councils. Four years of aggressive class warfare by the Con-Dem government has left tens of millions of people in England poorer and feeling more financially insecure than ever before. The poor and the unemployed are held up as objects of scorn and abuse by the entire political class. And who is the principal beneficiary of this situation? The first really successful far-right party the country has produced. If the Labour Party continues to use the same language as UKIP on immigration and benefits there will only be one winner in that race to the gutter.